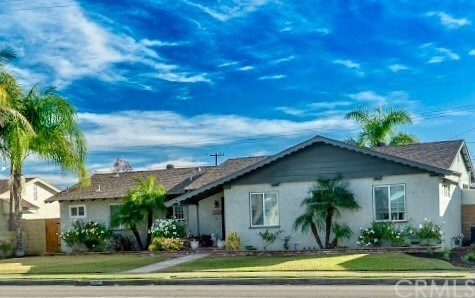 Here is your chance to see this very improved and beautiful home located in the coveted City of Orange. The home is not only well maintained but also greatly upgraded. New windows recently installed. Marble fireplace with custom oak mantle. The kitchen is fully remodeled including granite counter tops. Porcelain tile flooring in the kitchen and dining room area. All bathrooms have been upgraded and one bath has a Jacuzzi tub. Completely upgraded laundry room. There is a French door leading from the master bedroom to a concrete patio with red brick and the back yard. Custom built-in oak closet and office desk in one of the bedrooms. 6 panel doors upgraded and installed. Canned lighting installed throughout the home. Insulation has been added to the walls of the house. HVAC unit installed for central air conditioning and heating. Upgraded garage door. Wooden gates added. There is RV parking slab with rolling gate for alley way access. Landscaping and hardscape include red brick/sidewalks/caps. There are fruit trees in the back yard such as avocado, orange and peach. There is also a children's playhouse that will remain. Washer and dryer are included as well as the refrigerator. Conveniently located close to Old Town Orange, Chapman University, Santiago Canyon College, Irvine Regional Park, St Joseph Hospital, C.H.O.C., retail stores, restaurants and groceries. Walking distance to McPherson Magnet School, Starbucks, 85 Degree Bakery and In-N-Out. Easy access to freeways.